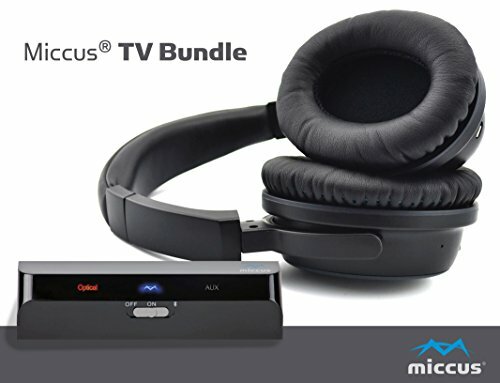 The MTVB-01 Optical Bundle includes: *Miccus Home RTX Mini - Bluetooth transmitter (Amazon ASIN B0197VRGVI) and *Miccus SR-71 Stealth - Bluetooth headphones (Amazon ASIN B01GGKNYOQ). What's in the Box? Quick Start Guide Miccus SR-71 Stealth Headphones Hard-sided Travel Case USB Charging Cable 3.5mm Stereo Audio Cable User Manual Miccus Home RTX Mini Optical Cable 3.5mm audio cable USB cable Velcro Mounts Enjoy peace of mind - 2-Year No Hassle Warranty. Miccus brings you another solution to simplify your mobile lifestyle. FREE PAIRING & EASY TO USE - Setup is easy. For your convenience, Miccus has already paired the products for FREE. Simply follow the quickstart guide final steps and within minutes, you will be enjoying high fidelity audio on your headphones from your TV. Will power on and off with your TV when plugged into the TV's USB port and automatically reconnect. KEEP THE PEACE: Stop squabbles over the sound and start enjoying full wireless audio. Select your volume on the v4.2 Stealth earphones without disturbing others. ...and YES, it is flexible. Others can still listen to the show via the Television speakers. Or use the headphones with your smart phone, tablet, laptop or PC. RELIABLE COMPANY AND SUPPORT: Designed by a Detroit based company to go the distance for you with responsive, easy to understand customer support. NOTE: 1) For TV use with 2 headsets, 2) long distance use past 33ft or 3) use with a sound bar, we recommend the Home RTX 2.0 (B075J4RKGH) with the Stealth headphones.